Ashley Dawson is a Harford County native who began her piano studies at Music Land with Amanda Noto in 2003. She continued taking lessons at Music Land for 9 years before continuing on to Harford Community College and Towson University, where she has since graduated with her Associate’s and Bachelor’s degrees in music. She has been teaching at Music Land since September 2014. Her private instructors include Dr. Joseph Satava, Dr. Chungwon Chung, Dr. Lawrence Crawford, and Timothy Murphy. She also received instruction in composition under the direction of Dr. Neil Anderson Himmelspach and jazz improvisational studies with Benny Russell. 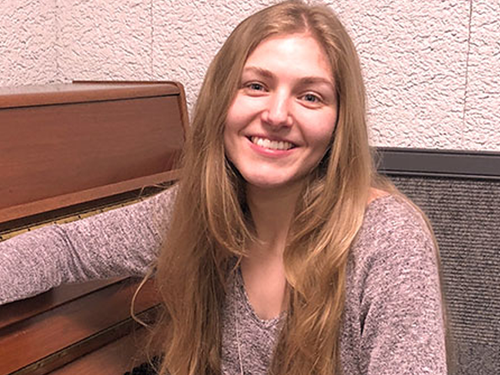 Ashley has taken part in many local competitions with high remarks and first place awards, and was the recipient of two music scholarships for her piano performance at Harford Community College and Towson University. She has experience in solo/ensemble accompaniment, chamber ensemble, and jazz ensemble. She continues to accompany school choirs, instrumentalists for county and state solo and ensemble, as well as other various vocal and instrumental events. Ashley is a member of the Harford County Piano Teachers Association, where her students take part in annual spring competitions. In addition, she holds 2-3 recitals per year for her students. Her prime emphasis is in classical piano performance, but she enjoys all musical styles. Her goals in teaching are to help students develop confidence in their musical abilities and experience an overall enjoyment in their music education. She welcomes players of all ages and experience levels, and works together with them to build a program that meets their personal ambitions.